In December 2018, Saudi Arabia will host the next summit of the Cooperation Council for the Arab States of the Gulf, which comprises six countries – Saudi Arabia, the United Arab Emirates (UAE), Kuwait, Bahrain, Oman and Qatar. The council is headed by Saudi Arabia, the region’s economic, political and military leader. Moreover, that country presents itself as the spiritual and religious leader of the Sunni Arab-Muslim world and the keeper of Muslim holies – the cities of Mecca and Medina associated with the life of the Prophet Mohammed. It should be noted that the 2017 GCC summit in Kuwait was attended by the heads of only two member countries, Kuwait and Qatar, because the other member states, along with a number of other Muslim nations, including Egypt, that supported them, accused Qatar of backing terrorist groups such as the Muslim Brotherhood, which, according to those countries, had organized a terrorist chain in those countries aiming to destabilize the ruling governments. Indeed, Saudi Arabia and Qatar have been engaged in a rather long-standing religious and political confrontation. Firstly, these countries adhere to slightly different versions of Islam – Wahhabism in Saudi Arabia and a version closer to the Muslim Brotherhood doctrine in Qatar – and secondly, Qatar, relying on its strong financial capability derived from natural resource exports, is trying to compete with Saudi Arabia and play an increasingly important political role in the GCC, the region, and the world. Saudi Arabia, the UAE, and Bahrain also accused Qatar of having contacts with their adversary, Shiite Iran. As a result, in 2017, those countries broke off diplomatic relations with Qatar and even tried to impose an economic blockade against it. On November 18, Deputy Foreign Minister of Kuwait Khaled Al-Jarallah confirmed Qatar participation in the coming annual summit of heads of state of the Gulf Cooperation Council (GCC) countries, supposed to be held on December 9th in Riyadh. The statement of Al-Jarallah has raised many questions. At present, the heated confrontation between the Saudi-led coalition and Qatar has somewhat cooled down, which is why all the GCC members, including Qatar, are expected to attend the December 2018 summit. 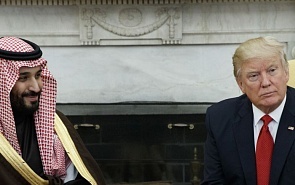 It should be noted that this summit is scheduled shortly before another, no less important, meeting of the GCC leaders with the US leadership to be held at Camp David in January 2019. The 2018 summit participants are expected to discuss the US plan to create a Middle Eastern strategic alliance – a kind of Arab NATO with an overtly anti-Iran policy – and, possibly later at Camp David, the discussion will continue. The potential members of the new bloc are the GCC members, Egypt, Jordan and possibly a number of other Arab-Muslim countries. Israel also expressed an interest in joining the new alliance, which is unlikely, however, given its tense relations with many Muslim states. If the bloc is created, its main beneficiary will be Saudi Arabia, which has had the most serious row with Iran since the Islamic revolution in Iran in 1979. Moreover, Saudi Arabia has not achieved any tangible success in the conflict in Yemen, where Iran supports the Houthi movement. Furthermore, Houthi units even penetrated into Saudi Arabia, where the Saudi military suffered losses in clashes with them. So, if the Arab NATO is established, the odds in the Yemen conflict may shift in Saudi Arabia’s favor. Similarly, this may affect the situation in Syria, although Russia is playing an important role there, and the Arab NATO, even with US support, is unlikely to risk a military-political confrontation with the Russian Federation. An ‘Arab NATO’ could also affect the developments in Lebanon and reduce the influence of the Hezbollah movement supported by Iran. Therefore, Israel could benefit from the new bloc’s creation as well, as Iran and Hezbollah are its main adversaries in the region. For Iran, the new alliance would be a real threat and would weaken its military-political positions in the region. In response, Iran could attempt to establish closer ties with its more loyal allies and partners, primarily with Russia. Also, if the United States continues to pressure Iran as a result of withdrawing from the nuclear deal, Iran might resume work at its nuclear facilities, which would be the worst scenario. However, an Arab NATO remains a project, and its implementation is still in question.